…The feminist contempt for motherhood is a variation on how progressive intellectuals, who have careers, hold a special contempt for those of us who merely have jobs. The reason progressives are always proclaiming their devotion to “workers” is because progressives consider people who work actual jobs to be in need of the intelligentsia’s charitable sympathy. Feminists love to talk about “working mothers,” but feminists are generally neither workers nor mothers. It takes a Ph.D., faculty tenure and a six-figure salary to be able to advocate the interests of those grubby moms who are too dumb to know what’s good for them. Pitying a person is not the same as helping a person, and the liberal’s problem is that he doesn’t know why the difference matters. They would rather do “Fondue Sets for Namibia” — promoting some kind of do-gooder project to “help” a distant person whom they feel deserving of their liberal pity — than to actually do anything to help nearby people who are less exotically “oppressed.” If your car breaks down on the freeway three miles from the nearest exit, you’ll walk the entire distance, both ways, before a liberal stops to help. Liberals are without exception the most thoroughly selfish people on the planet. -The Left accuses us of bad things and Evil motivations for what it, itself, is actually doing. This is called ‘projection’ by the Shrinks. -Have you ever met a Leftist who, if you probed down deep enough, was really happy? No. They’re all to varying extents unsatisfied with Life as it is and hate their lot in it. Instead of looking into their own Souls, seeking out the reasons for their Nihilism, and, then, working to change their outlook on Life, the Leftists turn outward and blame Society [Eric Idle of Monty Python: ‘It’s a fair cop, but society’s to blame’ / Cop: ‘We’ll arrest them too’]. The next step for them is to adopt one of the many flavors of Leftist Thinking that provides them with what they believe is the best path to Utopia, where they can teach the world to sing in perfect harmony, grow apple trees and honey bees and snow-white turtledoves. The Leftist, no matter what year they are born into, is always a member of The Me Generation. Refusing to take any responsibility for their own actions and miserable in their Irrational Selfishness, they lash-out at the rest of the World, especially those who reject Nihilism and the belief that Heaven On Earth can be achieved. To put it succinctly: Leftists are mentally unstable. It is imperative to know this when you are forced to deal with one. 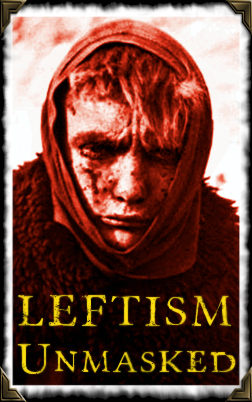 If you can, avoid arguing with Leftists just as you would avoid arguing with a madman in an insane asylum. Walk away from the Village Idiot; back away from the mad Clown [although, you may honk their nose, but be careful if you do]. The best way to deal with Leftists is to take those actions necessary to see that they are removed far away from the levers of Power And Control. Time is very short. The center has collapsed. We no longer have the luxury of trying to persuade these deranged people. There’s an American Republic that needs restoring, that must be raised from under the rubble. The force which manifests itself in socialism does not act through reason but resembles an instinct which threatens the very existence of mankind and at the same time paralyses its most reliable tool, reason. DO NOT LIE, REFUSE TO PARTICIPATE IN THE LIE. Talking to a Progressive/Socialist/Democrat/Social Democrat/Communist/Khymer Rouge the difference between them is without a distinction, is always a fools errand when not downright dangerous. I try to avoid using the word Liberal since there aren’t any. Their heads are full of nonsensical slogans, dis-information and dubious dialectics. The more naive among them, are tortured by guilt, despair and anger over oppression’s of other peoples that aren’t actually happening. If being delusional is having ”A false belief held despite strong evidence against it;” and ”Delusions are common in some forms of psychosis.” Aren’t most leftists psychotic in the clinical sense of the term? You’ll find it far more rewarding and productive explaining gravity to a dog than explaining anything to a leftist. The dog can at least feign understanding and usually won’t interrupt you. I’d give you a hundred upticks just for that.